What is an Atlantean Healing™ Session? The attunement and the system were channelled by Birkan Tore and is now being taught internationally. The healing techniques taught in this class are a combination of the ancient techniques and the new ones given to us for the challenges we are facing today. Since we’ve passed 2012, we have the opportunity to bring back the high frequency life style of Atlantis and take it even further. Atlantean Healing™ sessions are designed to balance the energy field as Atlanteans believed dis-ease was a manifestation of the imbalance in the energy field. You will be also learning how to ”listen” to these physical conditions to find out their messages and discover their root causes when it’s possible. The energy is very powerful, yet it feels gentle when channeling or receiving it. Each session is conducted by an Atlantean Healing Practitioner™ and Atlantean Angels, who will be assisting with the application of the energy and healing process. You now are able to become Atlantean Healing Practitioners™ without lengthy priesthood trainings as we had to go through in Atlantis. During the two-day workshop you will discover past your lives in Atlantis and Lemuria through past life healing meditations. You will heal any traumas that keep you from fully experiencing your spiritual and psychic powers. You will receive an attunement to Atlantean Healing energy. A session is designed to balance the energy fields. A healing session can be given in person at the practice of on a distance; it is as powerful as in person. The Atlantean Healing™ Energy though, will continue working and balancing the energy field for several hours. This way there will be no sudden shifts that or outbursts of release caused by the AH treatment. 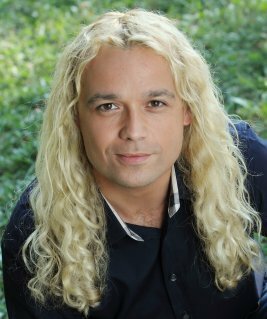 Birkan is an intuitive medium and Angel Therapy Practitioner. Based in Los Angeles, he teaches across the world. He is the author of ‘Rise and Shine: A spiritual wake-up call for sleeping beauties’, and the forthcoming “Help, I’m psychic!”. He regularly appears on European television shows spreading the message of the angels. Birkan is the originator of Atlantean Healing™ modality the creator of the Oracle Messenger ~OM~ workshop. Birkan uses his natural abilities to make the most celestial things something we could all relate to. In his practice he predominantly works with the Angelic Realm in order to help people unite with their angels and discover their connection to their Source. His natural teaching abilities help people understand even the most otherworldly terms and experiences. With ease and grace, he lovingly guides his students through his courses and readings, giving them the tools they need to help and heal many. Birkan began studying ancient spiritual practices of divination and healing starting at an early age. His natural craving for spiritual teachings opened a door to the ideas and philosophies of many different cultures and religions including the ancient Oracle practices of the Aegean, Anatolia and Mediterranean societies.